This is a fantastic, nippy little van with front dining room and sleeps three. Buyers get a choice of three modern interior schemes (and one which costs extra), plus six colours of exterior paint job. The City Car is convenient for parking, while also having the best of both worlds in terms of layout: there’s a rear pair of sofas converting to a double bed, plus a front table which, when you swivel the two front seats, can feed four. We particularly like the way the kitchen unit is easy to reach from the sliding door if you’re cooking outside. The bedroom area provides good storage for bikes and outdoor chairs and there’s also good storage under one of the bench seats. The washroom has a very modern design, with curved sink station and moulded sides, and shelves for storage. The City Car impresses us in so many ways. It’s only real drawback is that the sliding door is on the continental side. The IH Oregon R and RL are about as classy as it gets in terms of build – hence its price tag. We’d find it hard to leave out some of the extras which take this RL above the £49,995 base price. You might save yourself £1800 by changing to a manual gearbox and a further £1000 by choosing a 2.3 litre over the 3 litre but we personally wouldn’t want to dispense with the mechanism which has a flatscreen TV rising out of a cabinet. 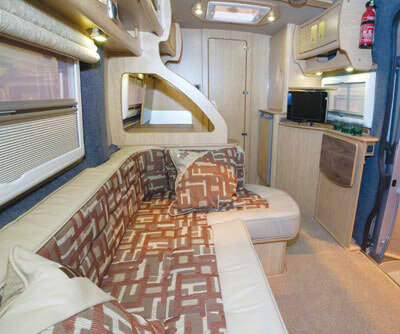 It’s the layout that really makes this motorhome special. The double bed packs easily away to form an L-shaped sofa directly facing the side door. A group of four or five friends could sit around this area easily. The small kitchen gains space thanks to a lift-up flap of worktop which feels truly sturdy. Kitchen cupboards have diagonal deep drawers which slide out. This may be the most costly here, but the IH is about emotion more than sheer practicality. This high top boats a huge lounge for a panel van. The converter is a small company initially set up to convert second-hand vans into motorhomes and now converts new Citroen Relay LWB vans into just two layouts, Constellation and Aurora. 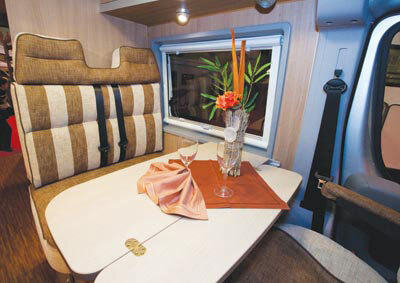 Constellation has a six-foot sofa opposite two single passenger seats – one facing forward, one backward. It’s a fantastic lounge if you need to accommodate a lot of visitors, though the seats impede access to the side door a little. 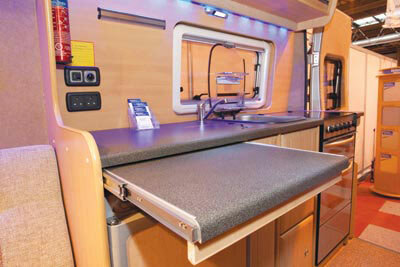 At night the six-footer becomes a double bed and the mechanism is one of the quickest and easiest we know. The basic spec of the Constellation is good. But we’d recommend paying extra for the Luxe Pack. As well as the TV and a fridge upgrade to 100 litres it includes an RAC backed three-year warranty so you can have any work done locally to you if you don’t live near Wildax who are based in West Yorkshire. All kept at home at TD9 8BD. Motorhome owners – professionals over 50 years old with no claims, convictions or health conditions in last 3 years. 4 years no claims bonus mirrored from car policy and 2 years motorhome driving experience. Members of motorhome club doing less than 7000 miles annually. £250 excess applies. European Breakdown £42 extra. Premiums include insurance premium tax at 5% and are correct as of 18.08.10.